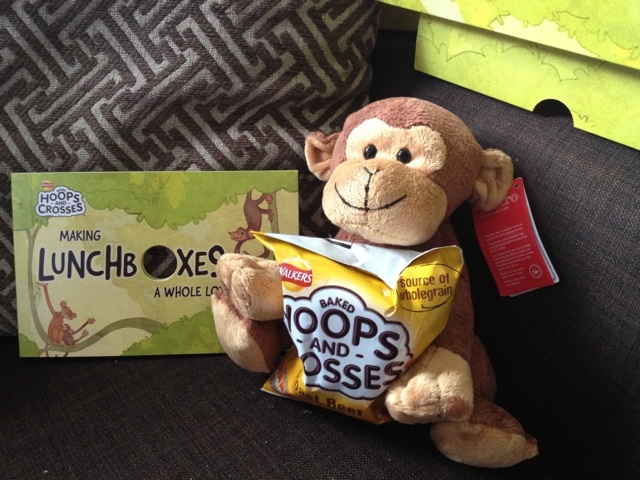 Over the weekend we received an exciting package from Walkers crisps. Inside the package was a pack of their brand new Roast Beef flavour Hoops and Crosses crisps and an adorable monkey called Monty! Of course chief food tester in the house is Gracie and i've been trying to prepare her for school in september which will include packed lunches. She loves her sandwiches and will eat anything on wholemeal bread. Now the problem is finding healthy snacks to go with them. This is where Walkers Hoops and Crosses come in. Walkers Hoops and Crosses come in three different flavours; Roast Beef, Salt & Vinegar and Prawn Cocktail (all three flavours are suitable for vegetarians). Although they come in three popular crisp flavours they are no ordinary crisps. Hoops and crosses are made from wholegrain and contain no artificial colours or preservatives. Each bag contains just 85 calories. 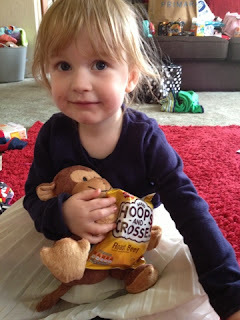 The hoops and crosses snacks come in the shape of noughts and crosses making them a fun snack for older kids. Gracie didn't understand the concept as she is too young and the crisps didn't last long enough to be played with but I definitely think it's a great idea! They would make a great healthy alternative for any kids lunch. Gracie wanted to try them straight away and as it was lunch time anyway we made her up a little picnic lunch to share with Monty the Monkey. Gracie usually loves cheesey or plain crisps so when we received roast beef I wasn't expecting her to be keen. She pulled a face after the first lick but was soon shovelling them down stopping every now and then to give Monty a taste. I managed to sneak one out of the packet while she wasn't looking and it was yummy! Unfortunately it was the only one I got. 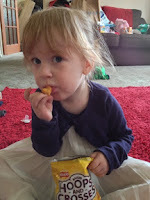 The pack was the perfect size for Gracie none of the crisps went to waste and she didn't feel the need to ask for another packet once she had finished. 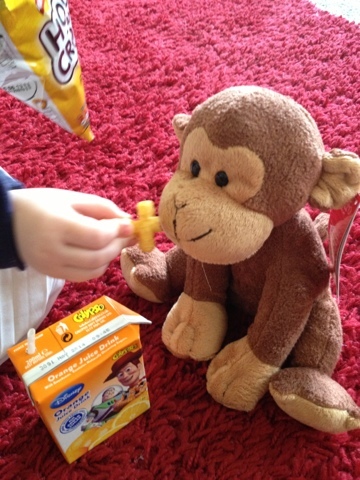 She's been asking for 'monkey crisps' every day since so they will definitely be a new addition to our shopping list and will be an essential healthy snack for her lunch box. The only thing I would improve is the choice of flavours by adding cheese or tomato flavours. Walkers Hoops and Crosses are available from most supermarkets. 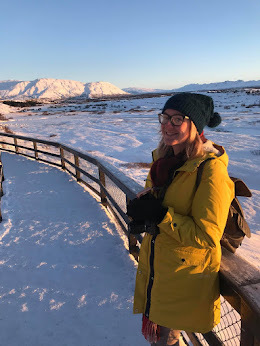 I received the products featured free of charge for review and will be receiving payment for writing this post but this has not affected my opininon on the product. All views are completely my own.